Rob has a distinct artistic style and he is a story teller – he makes me smile. I have known his work, much longer than I have known his name, but there is something about his style that really resonates with me and takes me to my happy place. 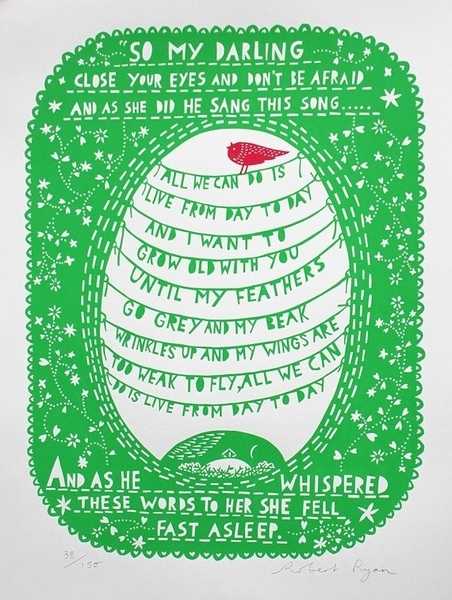 Rob Ryan HQ, Bethnel Green, East London – here he and his small but industrious team of elves produce the most fascinating and varied collection of art pieces, ranging from screen prints, laser cuts and limited edition ceramic. My research on Rob, basically consisted of watching several YouTube videos over and over and I have included the links at the bottom of this post. The magical about Rob is that by his own admission he creates ‘simple, straight forward images that aren’t overly mysterious.’ They are easy to understand and easy to relate to – often evoking a romantic element and identifying with our aspirations to love and be loved. I feel there is a primitive connection between paper and love, in as much as they are extremely vulnerable, fragile and both need love and attention to be maintained. Mister Rob, says his job is to look, think and reflect on the world and to be a conduit in translating the beauty in the ordinary and everyday and help make people see just how beautiful their lives are. I say it again, he is a true story teller. 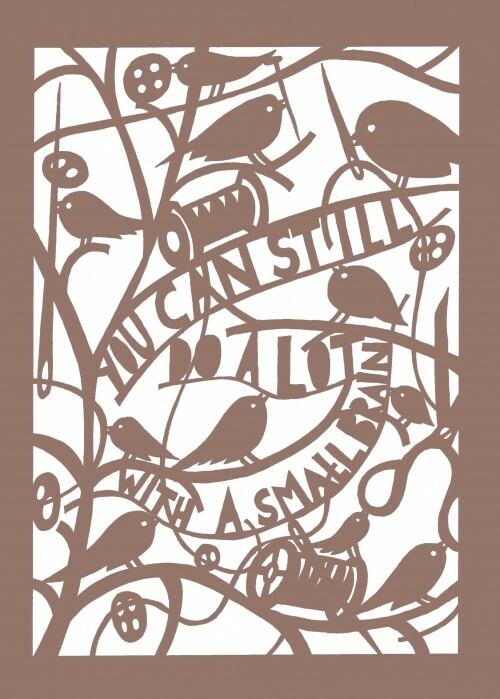 One of my favourite paper-cuts of Rob’s appeared in his book ‘A Sky Full of Kindness’. The passage is so beautiful it made me tear up and laugh at the same time. I have included an image below. Principally his art is about drawing, then cutting strips out and back to the bare essentials. His style is not technically ‘perfect’, but I think that is what makes it unique, and as long as he has a desk, and pencil and paper he can create. The computers are secondary to his creation processes. 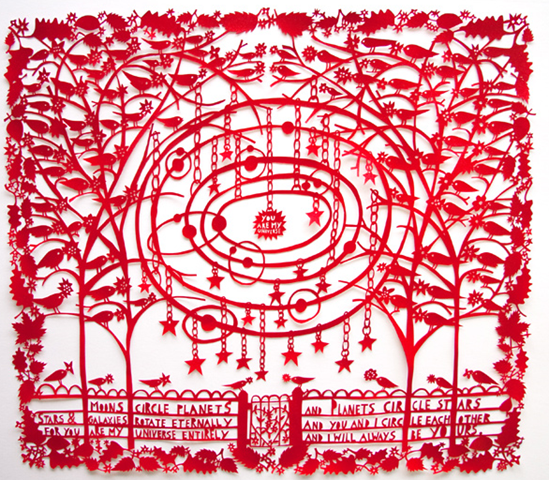 Everything is cut from the one piece of paper, all elements and relationships on the page are interconnected with each other. Many of Robs cuts are set in a background of nature a ‘timeless era’, he describes it. His art is about being alive, being human, being a person and LOVE. He says that sometimes love is almost too obvious to make art about – but for him, it is the most natural thing. The need to love, the need to be loved and the connections and relationship.